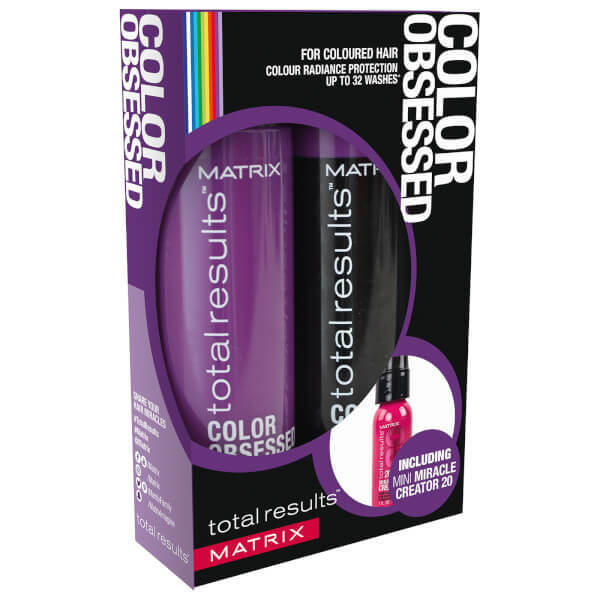 Treat coloured hair to the Matrix Total Results Color Obsessed Christmas Gift Set; a revitalising shampoo and conditioner with a mini Miracle Creator spray. Housed in a branded box. Innately rich with shielding additives, the concise ingredients work efficiently to enhance vibrancy and prolong appearance, providing an overall finish of sheen, polish and body. Containing enriching Vitamin E and body-lifting Sunflower Oil, the concentrated blend helps eliminate dull residue and renew moisture, strengthening porous hair and leaving it radiant. Set in a dense, textured blend with vigilant Fade Guard technology, the luxurious formula acts as an aid to natural colour stability, providing hair with surplus stay-in support. Containing enriching Vitamin E and body-lifting Sunflower Oil, the concentrated mix replenishes and restores hair to reveal strong, healthy-looking locks with maximum colour vibrancy. Delivering 20 benefits, the lightweight spray helps to prevent breakage and split ends, whilst taming frizz and defending against heat damage to leave hair healthy-looking from root to tip. Replenishing moisture and smoothing strands, the versatile formula primes hair for styling; effortlessly detangling and improving manageability for salon-worthy results. 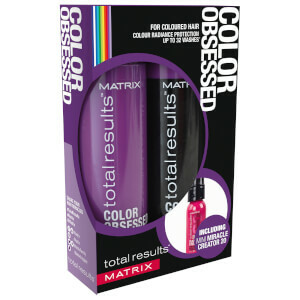 Hair is soft, sleek and conditioned without greasy residue. Shampoo: Apply to damp hair. Lather, then rinse. Conditioner: Apply to freshly cleansed hair and massage. Rinse. Spray: Apply product on towel-dried hair, comb through and style as usual. Shampoo: Aqua / Water, Sodium Laureth Sulfate, Coco-Betaine, Sodium Chloride, Glycol Distearate, Dimethicone, Parfum / Fragrance, Sodium Benzoate, Hexylene Glycol, Cocamide Mipa, Salicylic Acid, Carbomer, Helianthus Annuus Seed Oil / Sunflower Seed Oil, Guar Hydroxypropyltrimonium Chloride, Tocopherol, Linalool, Benzyl Salicylate, Limonene, Butylphenyl Methylpropional, Hexyl Cinnamal, Citronellol, Benzyl Alcohol, Alpha-Isomethyl Ionone, Methyl Cocoate, Sodium Cocoate, Sodium Hydroxide, Citric Acid. (F.I.L. D43803/1). Conditioner: Aqua / Water, Cetearyl Alcohol, Behentrimonium Chloride, Glycerin, Cetyl Esters, Isopropyl Myristate, Isopropyl Alcohol, Parfum / Fragrance, Phenoxyethanol, Lauryl Peg/Ppg-18/18 Methicone, Helianthus Annuus Seed Oil / Sunflower Seed Oil, Tocopherol, Linalool, Chlorhexidine Digluconate, Citric Acid, Benzyl Salicylate, Limonene, Butylphenyl Methylpropional, Dodecene, Poloxamer 407, Hexyl Cinnamal, Citronellol, Benzyl Alcohol, Alpha-Isomethyl Ionone (F.I.L. D43801/1). Spray: Aqua / Water, Cocos Nucifera Oil / Coconut Oil, Amodimethicone, Polyquaternium-37, Phenoxyethanol, Propylene Glycol Dicaprylate/Dicaprate, Parfum / Fragrance, Acetamide Mea, Lactamide Mea, Dimethicone Peg-7 Phosphate, Ppg-1 Trideceth-6, Trideceth-6, Behentrimonium Chloride, Glycine Soja Oil / Soybean Oil, Prunus Amygdalus Dulcis Oil / Sweet Almond Oil, Xylose, Lactic Acid, Ethylhexylglycerin, Isopropyl Alcohol, Cetrimonium Chloride, Hydrolyzed Vegetable Protein Pg-Propyl Silanetriol, Sodium Chloride, Linalool, Coumarin, Potassium Sorbate, Tocopherol, Sodium Hydroxide. (F.I.L. D170511/2).